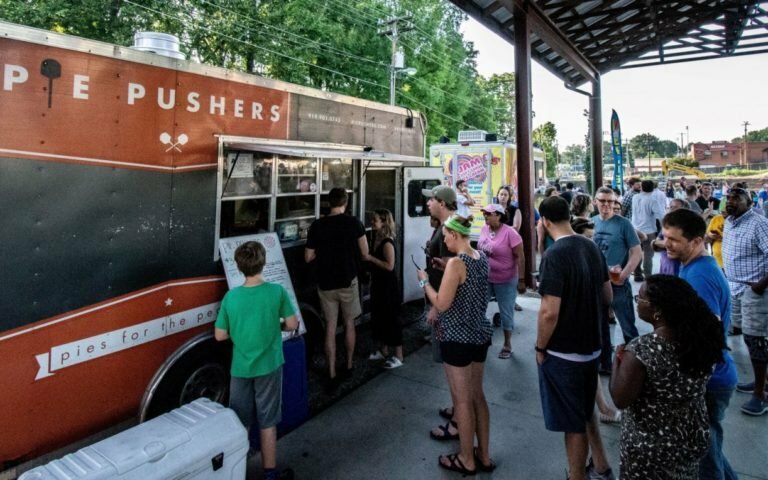 A Durham Central Park Food Truck Rodeo is an all-ages Sunday afternoon gathering of dozens of the Triangle’s most popular food trucks, five times each year. The event is free to attend. You simply pay for what you decide to eat from the trucks’ menus–from savory and stick-to-your-ribs to sweet treats. Selector B Steady will make winter feel like SUMMER with Rocksteady, Reggae, Roots and Dub) African Funk, Peruvian and Cumbia vinyls!! University of North Carolina at Chapel Hill‘s PEARLS Program for Early Autism Research, Leadership, and Service will be with us, complete with balls, books, push toys, rubber ducks, blocks, and giant bubbles. They invite parents to complete a developmental screening questionnaire about their children 11-30 mo of age. They will give families feedback about their children’s development, and have lists of free local resources where families can go to for developmental support, if necessary. Guest trucks have included Route Bistro LLC, Chirba Chirba Dumpling, Virgil’s Jamaica and Bulkogi Truck. Locally-brewed craft beer, cider and a band or DJ are always on hand. Dogs are allowed at the Food Truck Rodeo on regular (not retractable) leashes. Food Truck Rodeos are rain or shine. Most trucks accept credit cards but an ATM machine is on site as well. Free parking is available in nearby lots. Bring a blanket or a lawn chair so you can enjoy a relaxing and enjoyable Durham afternoon with friends and family.